The ISDN is an abbreviation of Integrated Services Digital Network. The current communications networks vary with the type of service, such as telephone network, telex network, and digital data transmission network. On the other hand, the ISDN is an integrated network for various types of communications services handling digitized voice (telephone) and non voice (data) information. A complete, terminal-to-terminal digital network. Fig.3 shows the end-to-end digital connectivity. A network that provides both telephone and non-telephone services in the same network. 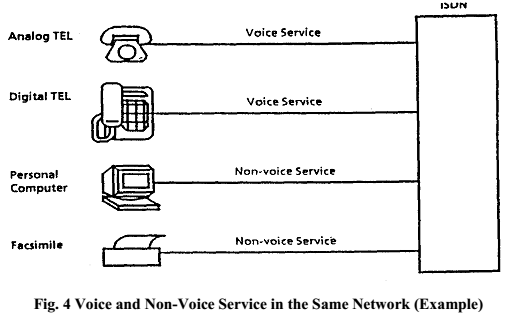 Fig.4 shows the voice and non-voice services in the same network. A network based on a digital telephone network. A network that utilizes Signaling System No. 7 (SS7) for signaling between switching systems. Fig. 5 shows the signaling connection between Switching Systems. A network offers standard user network interface. Fig.6 shows the standard user network interface. 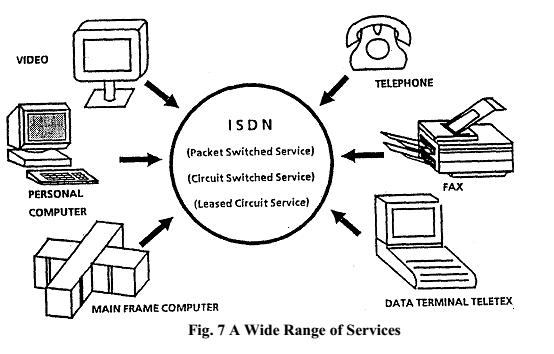 The ISDN provides the following functions, as shown in Fig.7. Circuit switching service includes both telephone and data circuit switching. As shown in the figure, ISDN can interface with various terminals, such as a telephone set, FAX, Video terminal or personal computer to provide a wide range of services. ISDN offers a variety of services, such as telephone, data and image transmission through one network. ISDN handles all information digitally. 2) Standard user-network interface. 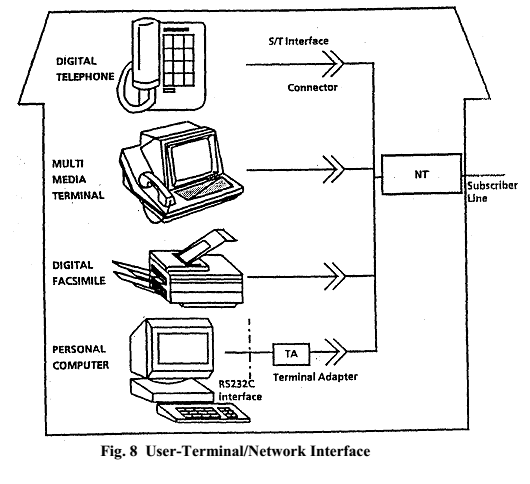 Fig.8 shows the user-terminal/network interface. The subscriber line is connected with an NT (Network Termination) installed at the customer premises. Various terminals are connected to the NT. These terminals can include digital telephones, multi media terminal, digital facsimile machines, personal computers, etc. as shown in the figure. The NT and terminals are connected by S or T interface (S/T interface), as recommended by the CCITT. Up to 8 terminals are connected to one S/T interface. The NT and terminals are connected using an 8-pin connector, which is also recommended by the CCITT. As shown in this figure, the personal computer uses the RS232C interface that is different from the ISDN S/T interfaces, so a TA (Terminal Adapter) is provided to adapt the RS232C interface for use with the ISDN interfaces. Fig. 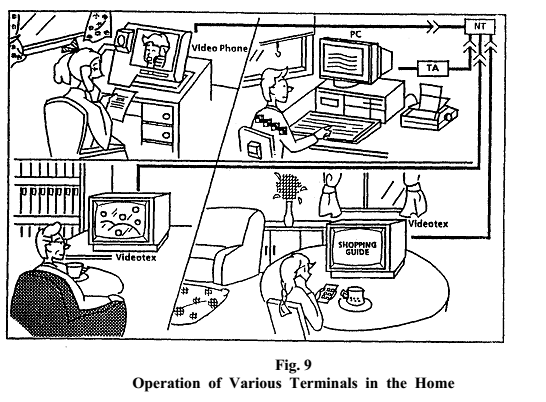 9 shows operation of various terminals in the home. Each terminal is connected to the NT through S/T interface which, in turn, is connected to the switching system through the subscriber line. At the upper left of the figure a person is using a television telephone called a Video Phone, at the lower left, a person is watching a picture on a Videotext terminal. 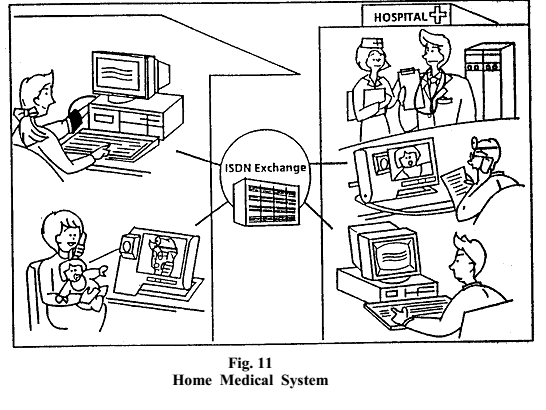 At the upper right of the figure, a person is operating a personal computer, which requires the use of a TA to convert the computer’s RS232C interface to the S/T interfaces used by ISDN. At the lower right, a person is doing catalog shopping using a Videotex terminal. 10 shows home shopping and home banking services. The goods are ordered using the Videotex terminal, and an instruction is output to the bank to transfer the amount of the bill from your account. The department store delivers the ordered goods. 11 shows home medical system. 11 shows another service provided by ISDN : the receiving of medical care at home. The upper left shows the measuring of blood pressure, with the result shown on the videotex screen both at home and at a medical facility (show at the bottom right of the figure). The lower left shows a consultation for medication using a TV telephone. 12 shows the interface between the user and the network. Telephone service makes use of two wires for the subscriber line between the switching system and customer’s premises. These same two wires can be ued by ISDN to receive ISDN services. An NT (Network Termination) is installed at the subscriber’s home and connected to the subscriber line. 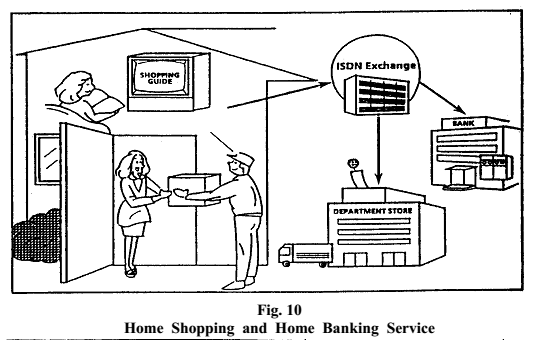 The Interface between the NT and the ISDN exchange (switching system) is called U interface. This interface has not been defined in the CCITT Recommendations because circumstances are different in each country. The point between the NT and the on-premises terminals is called the S or T reference point. The ISDN user/network interface refers to these S/T points, and is defined in the CCITT Recommendations. The S/T interface uses four wires, two for sending and two for receiving. Since U interface uses two wires, the NT provides a two-wire/four-wire conversion function. CCITT recommends the use of AMI (Alternative Mark Inversion) code at the S/T point. AMI code is a bipolar waveform. As shown in the figure, the ISDN Terminal provides S/T interface that follows the CCITT Recommendations, and can be connected directly to the NT. 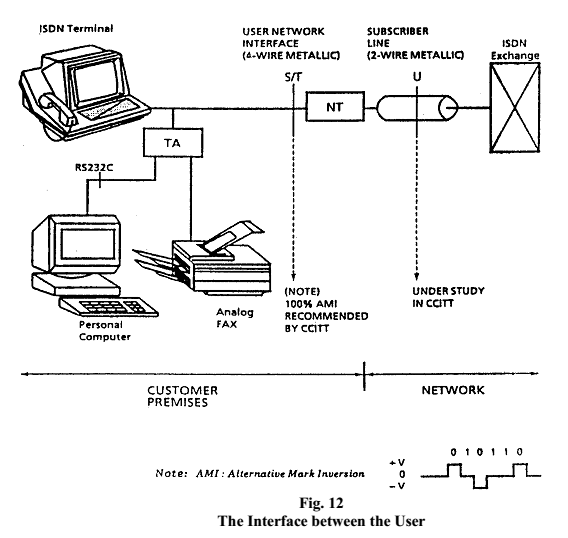 Since the personal computer and the analog FAX utilize a different interface from S/T interface, they require protocol conversion by a TA (Terminal Adapter). In the existing telephone network, a point at which a service is provided for a user, that is, a service access point is located at a rossete between the user’s telephone set and the subscriber line. Since the ISDN provides various types of service other than telephone service through a plural number of terminals, various service access points are provided. Thus, service access points would have to be defined corresponding to the ISDN Services. 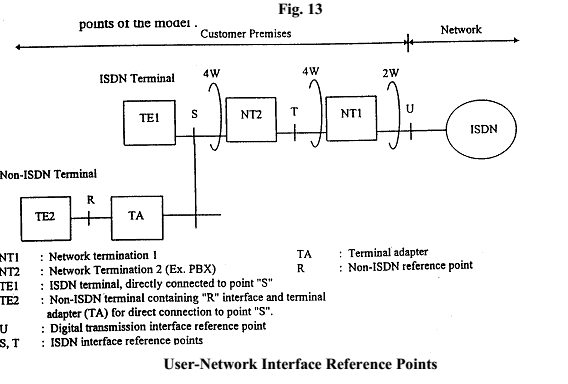 Fig 13 shows the user-network interface reference points which is based on the CCITT reference model and identifies the important reference points of the model. The following describes the user-access points and the function of each for basic user-network interface. The NT can be split into NT1 and NT2. NT1 and NT2 are terminating equipment for the network. In this case, NT1 provides the Layer 1 functions, such as circuit termination, timing and supply of electricity, while NT2 provides the layer 2 functions, such as protocol, control and concentration functions. The TE can be split into TE1 and TE2. TE1 is an ISDN terminal which is connected to ISDN via the S/T interface. TE2 is a non-ISDN terminal which is connected to ISDN via a Terminal Adapter (TA) such as personal computer or analog FAX as described in Fig. 12. A TA is a physical device which is connected to a non-ISDN terminal (TE2) to permit access to ISDN. A 4-wire physical interface used for a single customer termination between a TA and NT2 or between TE1 and NT2. A 4-wire physical interface between NT1 and NT2. A physical interface used for single customer terminator between TE2 and TA. The subscriber line is called U-Interface and utilizes 2-wires.